Elevated concentrations of salinity and selenium in the tributaries and main-stem reaches of the Colorado River are a water-quality concern and have been the focus of remediation efforts for many years. Land-management practices with the objective of limiting the amount of salt and selenium that reaches the stream have focused on improving the methods by which irrigation water is conveyed and distributed. Federal land managers implement improvements in accordance with the Colorado River Basin Salinity Control Act of 1974, which directs Federal land managers to enhance and protect the quality of water available in the Colorado River. In an effort to assist in evaluating and mitigating the detrimental effects of salinity and selenium, the U.S. Geological Survey, in cooperation with the Bureau of Reclamation, the Colorado River Water Conservation District, and the Bureau of Land Management, analyzed salinity and selenium data collected at sites to develop regression models. The study area and sites are on the Colorado River or in one of three small basins in Western Colorado: the White River Basin, the Lower Gunnison River Basin, and the Dolores River Basin. By using data collected from water years 2009 through 2011, regression models able to estimate concentrations were developed for salinity at six sites and selenium at six sites. At a minimum, data from discrete measurement of salinity or selenium concentration, streamflow, and specific conductance at each of the sites were needed for model development. Comparison of the Adjusted R2 and standard error statistics of the two salinity models developed at each site indicated the models using specific conductance as the explanatory variable performed better than those using streamflow. The addition of multiple explanatory variables improved the ability to estimate selenium concentration at several sites compared with use of solely streamflow or specific conductance. The error associated with the log-transformed salinity and selenium estimates is consistent in log space; however, when the estimates are transformed into non-log values, the error increases as the estimates decrease. Continuous streamflow and specific conductance data collected at study sites provide the means to examine temporal variability in constituent concentration and load. The regression models can estimate continuous concentrations or loads on the basis of continuous specific conductance or streamflow data. Similar estimates are available for other sites at the USGS National Real-Time Water Quality Web page (http://nrtwq.usgs.gov) and provide water-resource managers with a means of improving their general understanding of how constituent concentration or load can change annually, seasonally, or in real time. 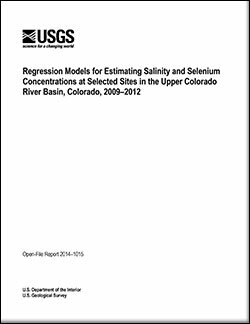 Linard, J.I., and Schaffrath, K.R., 2014, Regression models for estimating salinity and selenium concentrations at selected sites in the Upper Colorado River Basin, Colorado, 2009–2012: U.S. Geological Survey Open-File Report 2014–1015, 28 p., https://dx.doi.org/10.3133/ofr20141015.